Born in 1902 in the Stansfield area of Burslem, Stoke on Trent, Susie Cooper's education eventually found her studying under the influence of Gordon Forsyth, having been awarded a scholarship at the Burslem School of Art. Intending to pursue a career in fashion, her application to the Royal College of Art, London was rejected because she was not currently working in a related industry. 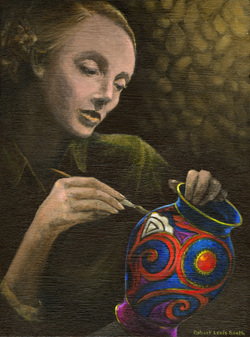 Gordon Forsyth suggested that Susie should work for a local potter, A.E.Gray in order to meet the college requirements. In 1922 Susie joined A.E.Gray initially to train as a paintress. however she was soon promoted to resident designer. A E Gray In 1923 A.E.Gray launched the Gloria Lustre Range which was developed in collaboration with Gordon Forsyth. Susie's progress was rapid, alongside the increase in production of bright hand painted ranges Gray's launched a new factory mark showing a steamship at full speed, and incorporated the words 'Designed by Susie Cooper.' This trend in designer marks was to become fashionable throughout the potteries during the 1930's. Early Years of Independence With an increased desire to design shapes as well as patterns Susie left Gray's to establish the 'Susie Cooper pottery' in October 1929. With the help of her family and particularly her brother in law, Susie took two rooms in a building known as the George Street Pottery, Tunstall. With the help of six paintresses a paint shop and office were established and then the decoration of pots began. Susie worked with Wedgwood through the 1960's and 70's during which time distinct patterns like "Carnaby Daisy," a bright harlequin set based on a simple daisy design, and the vibrant red "Cornpoppy" pattern were amongst her successes. Despite these triumphs Susie faced an increasing struggle with the corporate structure of Wedgwood and the restrictions this placed on getting things into production. Matters were not helped by the death of her husband in March 1972. Two months later Susie resigned her position as a director and operated solely as a designer. Twilight Years Recession in 1979 brought about the closure, by Wedgwood, of her beloved Crown Works. Susie moved her design studio to Adams & Sons (also part of the Wedgwood Group) and continued to work from there, until her move to the Isle of Man in 1986. From here she continued to work as a free-lance designer. 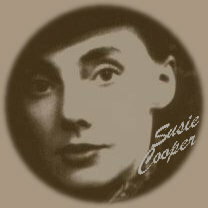 Susie Cooper died on 28th July 1995. The immense and diverse range of patterns that She designed have left the collector with a wonderful choice of areas to collect, early art Deco hand painted ware from the Grays period, her rare and elusive early independent productions, fresh floral lithographs of the mid 1930's, post-war sgraffito and bone china, or her work while with Wedgwood, the choice is vast.